Hi all, I just wanted to let you know that for a few days, I plan on going on a short hiatus. May be as long as a week. I am in the process of moving my office to our garage. That will give me much more room in our bedroom, but it will also let me put in a vanity table. Unfortunately, all this switching around is taking forever, so I will be on a short break until I get everything together again. Seems like I'm all about layering polishes over black nowadays. This is 2 coats of OPI DS Coronation over 2 coats of Illamasqua Boosh. Hope you all have a good weekend. I'm going to try and stockpile some posts over the weekend as my training is really ramping up and I don't know if I'll have much time to post after it all goes live. So, like I mentioned in the sorbets post, OPI broke this collection up into 2 groups... cremes and shimmers and their new sorbet finishes. Today, I have for you the cremes and shimmers. If you'd like to see my review of the sorbets, click here. Austin-tatious Turquoise - Bright turquoise blue with purple and pink shimmer. Sigh. As this one is amazing in the bottle, I wanted to like this one, I really did, but something (or perhaps several somethings) just doesn't work for me. First off, the color... it's bright and yet washed out all at the same time. It has almost a muddiness that doesn't work with the bright, caribbean blue. It takes forever to reach opacity (this is 4 coats) and the formula was think and slightly runny. 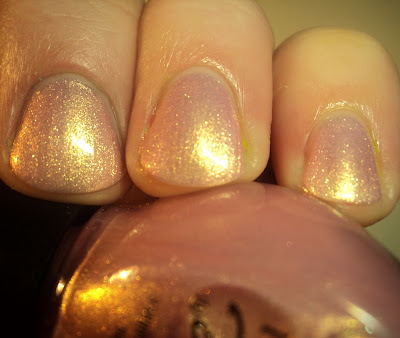 I've heard it mention that Iceberg Lotus from Nicole by OPI's Target exclusive spring collection is a good, better formula dupe, but though I have that one, I haven't compared them. 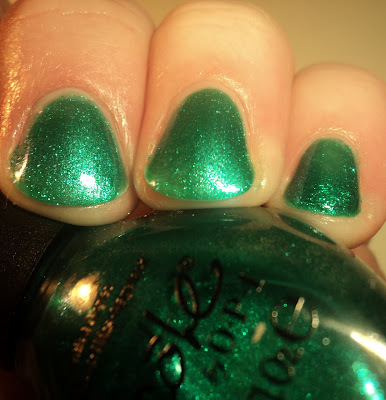 Don't Mess with OPI - Dusty grass green. Another one that seems dupe-able. It reminds me of ChG Starboard, though if I recall correctly, Starboard is less dusty and more vibrant. Nonetheless, I liked this one okay, but it was nothing memorable. Formula was a tad iffy. I had a wonky brush on this one and the formula was uncharacteristically thin. I also had a bit of a problem with drag. I Vant to be A-Lone Star - Pale, silvery blue with a slightly pearl finish. I liked this one a bit more than the first two. I did struggle with the formula is it had the same runny consistency as almost all the colors in this half of the collection. The color is very pretty, like a pale, silvery version of Nubar Blue Hydrangea. Like that polish, this one also gave me dirty-red-hands. Also, I get the Greta Garbo reference, but it seems a bit of a stretch to use a quote by a Swedish actress in a collection of Texas-themed polishes (but I fully admit that's nitpicking). 3 coats. Totally Fort Worth It - Pale, champagne silver with coppery pink/red microshimmer. This one I really liked. It reminded me of Color Club Ms. Hautie and Barielle Jess' Champagne Toast. Both of those polishes were silvery, frosty bases with micro-shimmer/glitter. IMO, Ms. Hautie was a disaster and, while Jess' Champagne Toast kinda worked, it still had issues. The probably with both of them was the thickness of the frosty base. Well, in this polish, the thinness of the formula works. Because it is so thin, you are able to build up the shimmer without in sinking in the base color. It was frosty, so you had to watch your strokes, but it wasn't a huge issue. 4 coats. San Tan-tonio - Warm, medium tan. Okay, I thought I would hate this one. I put it on, expecting to go "ugh, get if off" when surprisingly, I loved it. There's something about this color that works with my pale pink skin. It's a good neutral without getting into freaky "mannequin hands" territory. It reminds me of leather. Also, I think this one would look amazing topped with white crackle. The formula was still thin, but more manageable with this one. 3 coats. 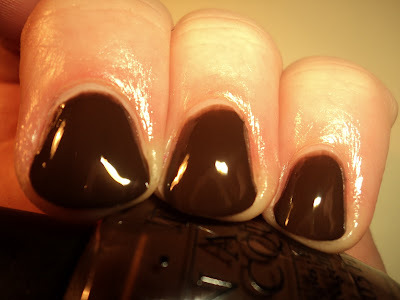 Suzi Loves Cowboys - Warm, red-based chocolate brown. Okay, if you could take Stetson and make it a nail polish... it would be this color. There was a redness to this one that reminded me of mole' (which is appropriate for a Texas collection). I did find the red-tone a tad off-putting with my skin, but it's such a pretty brown that I can overlook it. Best formula of the bunch. 2 coats. All in all, I have to say, I was maybe a tad let down by this part of the collection. The sorbets were so amazing that I was expecting such greatness from these 6 as well. Unfortunately, the just didn't meet my high expectations. San Tan-tonio, It's Totally Fort Worth It, and Suzi Loves Cowboys were my favorites. Austin-tatious Turquoise was my biggest disappointment, sadly enough. I waffled on posting this all day. Thing is, it took this about 2a, after taking a sleeping pill, so my cuticles look awful. I'd been swatching Zoya's summer collection and I must have been high when I removed the last one. However... this color is too amazing to not post it. So, my apologies in advance for my bad cuticles and for any lemmings this may have created. This is one coat of Sally Hansen Turquoise Opal over 2 coats of Illamasqua Boosh. 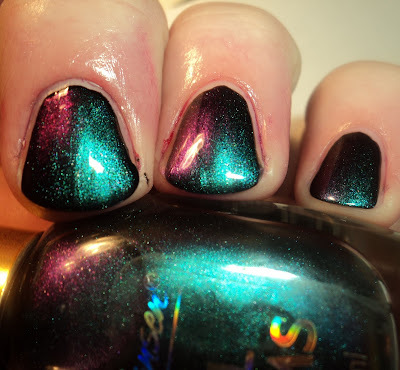 Remember all my whining about wanting an oilslick polish. Well girls, this *almost* kills the lemming. I still want something a bit more pastel, but this is so gorgeous that I may forget about the oilslick. LOL. Then, just a little bit ago, I got a little creative. I was getting ready to take this off, so I figured I'd play with it. This is ChG Crushed Candy over my original mani. I used a swirl/circular motion. I also topped it with another coat of Turquoise Opal and then TC. Unfortunately, Turquoise Opal is HTF and you have to resort to eBay. I hate to say it because scalpers make me stabby, but if you can afford this... you need it. These were all purchased by me. Just when you think every polish company is busy churning out crackles, Zoya does the unexpected and takes us back to 2009 with another matte collection. Don't get me wrong, I love it when a polish company keeps us on our toes, and this was certainly unexpected. Unlike Zoya's previous matte offerings, these are matte neons. Now, normally, neons dry with a satiny finish anyway, but these dry super matte. Also unlike the previous matte collections, only one of these polish contains any shimmer. The formula on these was pretty much the same for all the colors. They were surprisingly thin and and a tad streaky up until 3 coats, which isn't a HUGE problem. Normally with mattes, multiple coats is just asking for weird marks and bumpiness, but these evened out really well. 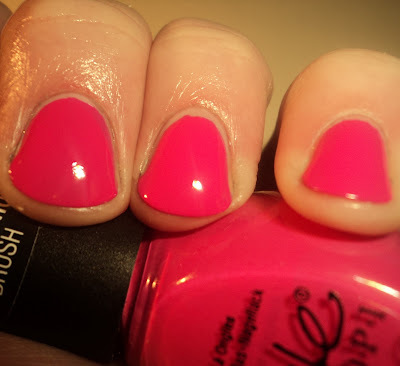 Lolly - Bright pink matte. Given the fact that OPI came out with La Paz-itively Hot matte almost 2 years ago, this color isn't incredibly unique. I blog-sold my LPH matte, so I don't have it for comparison, but I do think that Lolly is perhaps a tad lighter. Also, it doesn't have any shimmer. I do like the color though. It's very pretty, and flattering for any skintone. 3 coats. Mitzi - Bright chartreuse green matte. You may remember from my NOPI Target spring review that I love anything in this tone of green. Back when in mid 1990's, I think I had a gazillion shirts in this color, and still gravitate towards it... in clothing. While I like the color, and think it's flattering when worn on my body, it just looks a little odd on my hands. It doesn't give me dirty-red-hands like mintier greens, it just doesn't play nice. That said, I think this would look great as a base for some of the upcoming crackles. 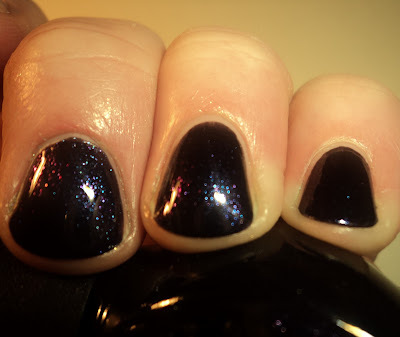 Can you imagine this with OPI's new Navy Shatter? Amazing. 3 coats. Phoebe - Bright caribbean blue matte. This one, probably not surprising, was my favorite of the bunch. It's a beautiful medium-toned blue. It makes me want to go on vacation... preferably somewhere warm, with palm trees and umbrella drinks. This one was my first of the 3 to swatch, so I had yet to realize that these were 3-coaters, hence the thin spots (though they were not as noticeable IRL as they are in my macro pics, so perhaps you can get away with 2 coats). 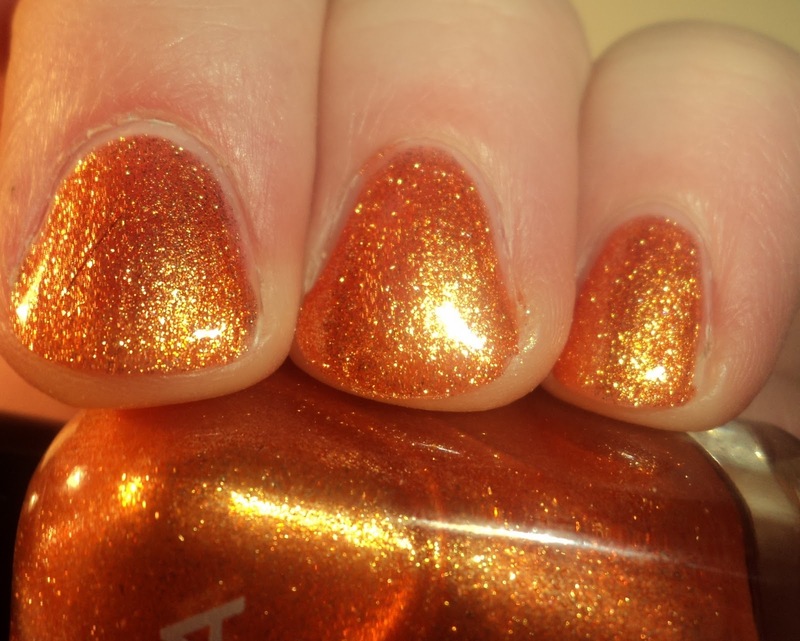 This one was the only one of the 3 with any shimmer, which looked amazing when covered with a TC (see below). Though, only Phoebe had any shimmer, I went ahead and topped all 3 with one coat of TC. IMO, all 3 look really nice with the TC added, but it doesn't really give the "aaaaah" factor (like TC over the OPI Suedes or the other Zoya mattes) as seen on other matte + TC combos. 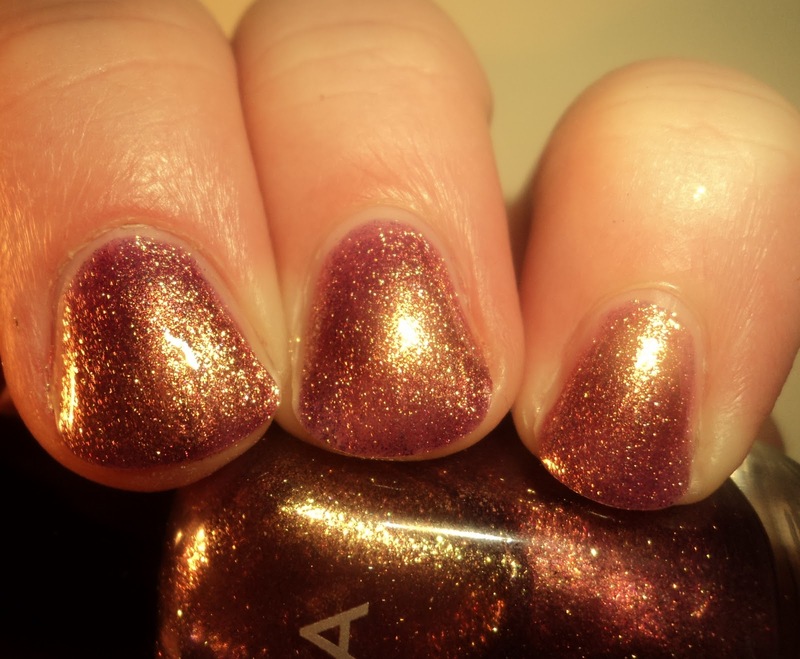 It does make the shimmer in Phoebe come to life, but it just makes the other 2 look like normal, non-matte polish. All in all, I think I like these. I wasn't a huge die-hard matte fan, and in fact, I've blog-sold all my mattes/suedes away, but there's something about these that make me like them. Maybe it's the bright colors or the pretty frosted bottles, but these are just happy and fun (something we can all use a bit more of, IMO). 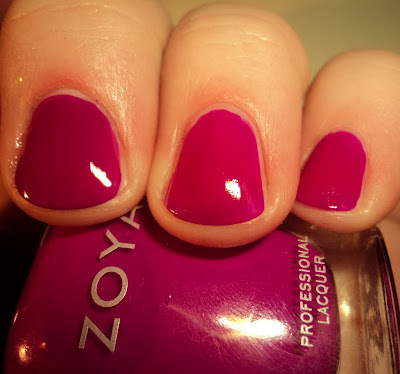 Zoya polishes are available at Zoya.com and various online boutiques. They are regularly $8, however, through tomorrow, they are offering a BOGO sale on all summer colors (this collection plus the 2 bigger collections). You have to already have registered for this, so if you are new to the brand, you won't be able to participate, but if you've ever purchased from Zoya before, taken advantage of their previous promos, or if you registered on their website by Sunday afternoon, then you probably have a promo code waiting in your account. Also girls, I wanted to mention that today is the last day for my giveaway. Be sure to click the link above to enter. This is 3 coats of Zoya Lolly (review coming) with freehand hearts in ChG Black Mesh and Lightning Bolt. It's pretty easy to freehand with the crackles, but you have to make sure you have just the right amount on your brush, as you really only have one shot (the black heart on ring finger is weird because I tried it twice). Picture was flipped so you can see detail. Also, I know my cuticles are a little rough. I've been using acetone during swatching and it kills my cuticles. I try to use my Kaylala cuticle creme between swatches, but sometimes it's not enough (as you can see on my middle finger). Lolly was sent to me for review. Lightning Bolt was sent to me for review. Black Mesh was purchased by me. Wow. OPI has been sending out press releases like nobody's bidnez. I know you guys are probably sick of them, but I thought this one was so pretty I couldn't help but post it. Also, they posted these pics on FB, so you may have seen it there. I can't wait to see Turquoise Shatter. OPI expands its Shatter line with the addition of three new trendsetting shades: Blue, Navy and Turquoise. With nautical hues of cobalt, indigo and sapphire, these blues provide the perfect look for summer nails in one simple step. Inspired by graffiti art, Shatter leaves behind a crackled, two-texture finish when painted over any dry OPI hue.Adding top coat takes Shatter from matte to glossy in seconds. In addition to the original Black Shatter, the line also features the Shatter coat in White, Red and Silver. All Shatter retail displays now feature Quick Response (QR)code, a two-dimensional barcode readable by smart phones and mobile phones with cameras and Internet capability. A quick scan of the display’s QR code will directly link to a demonstrational video – making application foolproof. will be available beginning May 2011 at Professional Salons, including Beauty Brands, Beauty First, Chatters, Dillard’s, JCPenney, Pure Beauty, Regis, Trade Secret, and ULTA, for $8.50 ($10.95 CAN) suggested retail for each Shatter coat. This just in from OPI. I am dying for the pink and red shatter all of them. :P I love pink and red together, so I can't wait to try that set in particular. Also, that gold glitter looks amazing and with white? That would be TDF for summer. Swatches should be hitting blogs sometime next month. White and Red Shatter Debut for French Open! OPI captures Serena Williams’ winning spirit with four additions to the Glam Slam! collection, including two new shades of the fashionable, must-have Shatter – Red andWhite. Launching in conjunction with the French Open, Glam Slam! France celebrates with two duo-packs for four unbeatable looks. The first Lacquer set includes Spark de Triomphe (a monumentally marvelous silver glitter), paired with White Shatter. Once applied over completely dried Nail Lacquer, Shatter begins to crackle, leaving behind a two-texture pattern on each nail. The second Lacquer set features Rally Pretty Pink (rise to the occasion with this shimmering sunset-pink), paired with Red Shatter. 1. Middle finger - I created this look using horizontal stripes rather than vertical. I think this is probably my favorite of the three. 2. Ring Finger - This was created by using half vertical strokes and half horizontal stripes. The "dividing line" is diagonally down the nail. 3. Pinkie Finger - This started out being more of a cross-hatch pattern, but morphed into a truly random patter when I started filling in the gaps. - have just the right amount of your brush. Too much will glob and too little will pull. - just one coat. 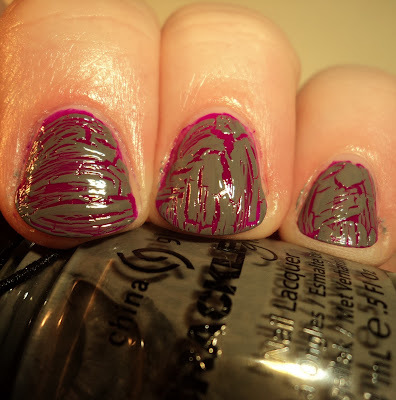 you can always apply another coat of crackle over the top of the one you are currently doing, for a cool layered effect, but don't try to do multiple coats of the same color at the same time. It won't crack and it will just look really thick and glumpy. ChG Cracked Concrete as well as 2 others were sent to me for review. I also purchased the entire set of crackles prior to receiving my review samples. Charisma was purchased by me. Sometimes I feel like all my polishes have a tendency to run together, so when something really catches my eye, I usually take notice. 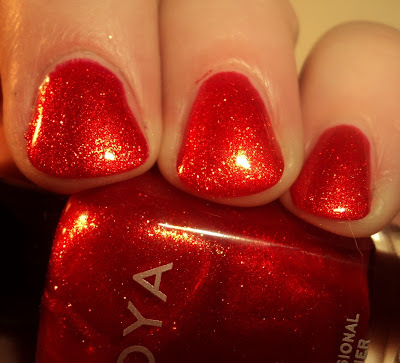 One of those such eye-catching polishes was Zoya Charisma. I picked this up a few months back, but just now got around to posting it. This polish is amazing. Seriously. Here she is without TC. Charisma is a neon, so she dries satiny. (sorry for the weird mark on my middle finger. that's thanks to my recent trip down fake nails lane :\). She's beautiful on her own, but once you add a top coat... sigh. Charisma is a beautiful red-based, bright purple neon. I love this polish and I love it on my nails. I find it very flattering. Does anyone know of anything else along the lines of Charisma in Zoya's line up? I love it so much that I'm dying for similar polishes (more in brightness of color and finish rather than color itself). Also, does anyone else call Zoya polishes "her". Such a weird habit. LOL. FYI, I wanted to mention, as this is a post about a Zoya polish, that currently, Zoya.com is offering a BOGO promotion on all their SUMMER polishes, limit 7 free (EDIT: I didn't realize initially that this promo was only for the new summer releases) The catch? You have to have registered before the promo went live. Basically, if you've ever bought from Zoya in the past, taken advantage of one of their previous promos, or registered prior to yesterday at 5p... you're in. I know they are doing individual promo codes for this promotion, so you will have to log in to your account and access the promos section. The code should be there. I know they recently mentioned on Facebook, that they still had 50,000 more codes to roll out, so if yours isn't there, give it a bit more time. Seems like I've been posting a lot about OPI's new collections and I have another one to show you. Seems like every summer, OPI has a soft shades collection, a brights collection, and a "regular" small collection. I've already showed you the releases for the soft shades (Cirque de Femme) and the brights (Pirates of the Caribbean), and today, I have for you the release of their summer collection, which is usually a small 4 piece collection (last year it was Summer Flutter). This year, they have a small collection of... get this... all pinks! Now, I know we as nail polish fans have a tendency to poo-poo "basic" colors, but I am so excited for this collection. I adore pink (especially bright pinks) and these look like beautiful colors. Here's the info from OPI... FYI, guys, these won't be available until June, though press samples should be making the rounds sometime in May. In yesterday's review post, I mentioned that Nicole by OPI Brilliant Idea reminded me of Deborah Lippmann Boom Boom Pow, so I figured I'd do a quick comparison for you (and for me. LOL). 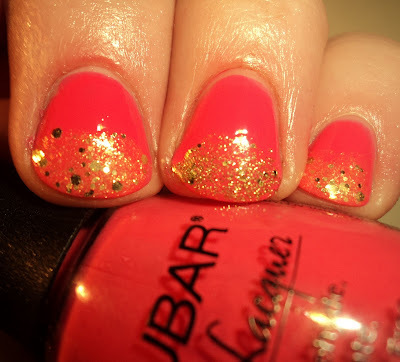 This is Deborah Lippmann Boom Boom Pow on my middle finger and pinkie and NOPI Brilliant Idea on my ring finger. 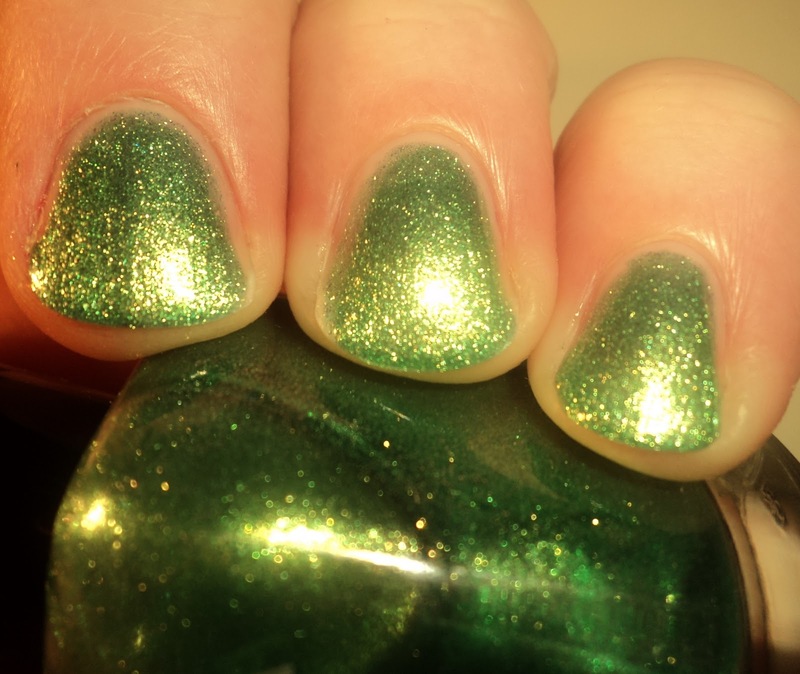 Tonally, though the NOPI is very green in the bottle, once you get it on the nail, especially layered, it really does look like a golden polish, so it's very similar to Boom Boom Pow. The differences are that the NOPI has a thicker base which is tinted (the Lippmann base is clear, but full of gold dust) and the hexagonal glitter in the Lippmann is larger. It's easier to layer with the Lippmann as there is no way you are gonna get that puppy opaque. That's not the case with the NOPI, so while you can do 3 coats with the Lippmann, you can only do 1, possibly 2, with the NOPI. Also, Brillant Idea doesn't contain the gold dust that Boom Boom Pow does, so it's lacking a bit of the brilliance, but again... it's still very close. As for the look of Boom Boom Pow over Honeysuckle, I am love with this, and it's my new favorite thing to do with Deborah Lippmann's hexagonal glitters. I'm actually planning more as I type this. Nicole by OPI Brilliant Idea and Nubar Honeysuckle were sent to me for review. Deborah Lippmann Boom Boom Pow was purchased by me. Yesterday, I showed you the first 9 polishes of this collection. Tonight, I bring you the remaining 3 polishes in the collection, all of which are glitters. 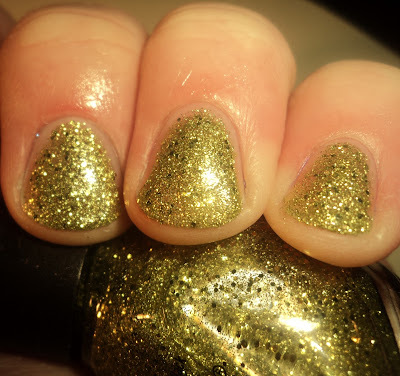 Brilliant Idea - golden-green mulit-sized glitter in a tonal clear base. In the bottle, this one is definitely green. However, on the nail, it turned much more golden. It actually reminded me of Deborah Lippmann Boom Boom Pow once it was on the nail. This one is jammed packed with glitter. I was able to reach opacity in 3 coats, something I didn't think would be possible one I saw it in the bottle. 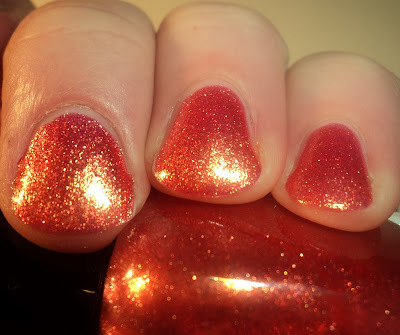 Make a Comet-ment - holo micro-glitter in a clear base. This one seems pretty straightforward... a holo glitter top coat. 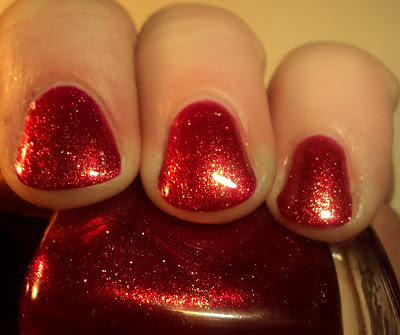 However, it's actually pretty unique in that it there is tons of micro-glitter in the base, and after 3 coats, your nail is so covered in glitter that you could get away with wearing this alone. You can, of course, layer this, but you don't have to, which is great. The application on this one was fantastic. Also, unlike the other 2 glitters in this collection, the finish on this one is very smooth without topcoat. 3 coats. 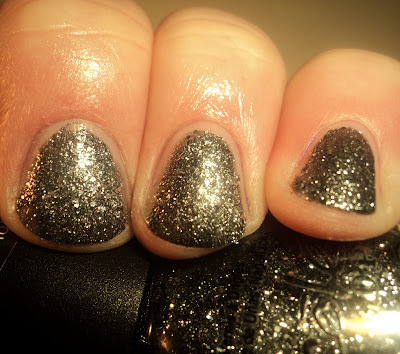 Nicole's Nickel - hematite grey, multi-sized glitter in a tonal clear base. Remember in yesterday's post where I said that one of these glitters was amazing? Well, this was the one I was talking about. It's so beautiful and incredibly unique. It almost looks like you have marcasite on your nails. This one, like Brilliant Idea is packed with glitter. It was almost opaque in 2 coats, but completely so in 3. This is one of my favorites of the collection. Gorgeous! Honestly, I wanted to mentioned that I did these separately because they are glitters and glitters in general are a PITA to swatch, but these were remarkably stress free. They removed extremely well. I love these. Love. Nicole's Nickel is FANTASTIC. Seriously. If you get two from this collection, get I'm a Pool for Your Love and Nicole's Nickel. Hands down. Again, these are available at Target and Target.com. 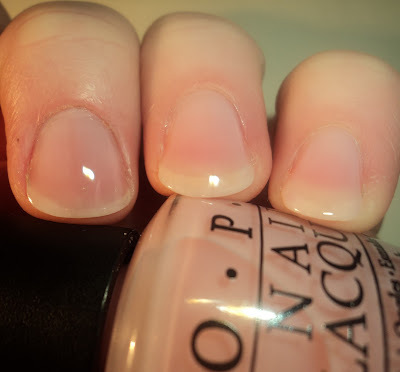 Recently, I received Nicole by OPI's Something About Spring collection for review. I had received the press release a couple weeks ago, and I was immediately intrigued by several of the colors, so I couldn't wait to get my hands on them. :) This collection is exclusively sold at Target and Target.com. This collection is pretty much divided into 3 groups... shimmers, cremes, and glitters. Today, I have for you the largest group, the shimmers, and the 2 cremes in the collection. Tomorrow, I should have the remainder of the collection. Daffy Dill - Bright lime green creme. This is a very pretty lime green in that it doesn't lean too yellow. It reminds me of the Fiercely Fiona and Who the Shrek Are You? from last summer's Shrek Forever After collection, but it didn't seem quite as bold as those two. Don't get me wrong... it's definitely in your face, but it's not day-glow. IRL, this is one of my favorite colors. I remember having a t-shirt this color that I wore into the ground. LOL. So it makes me smile, it's just a little too bold for me to wear everyday. 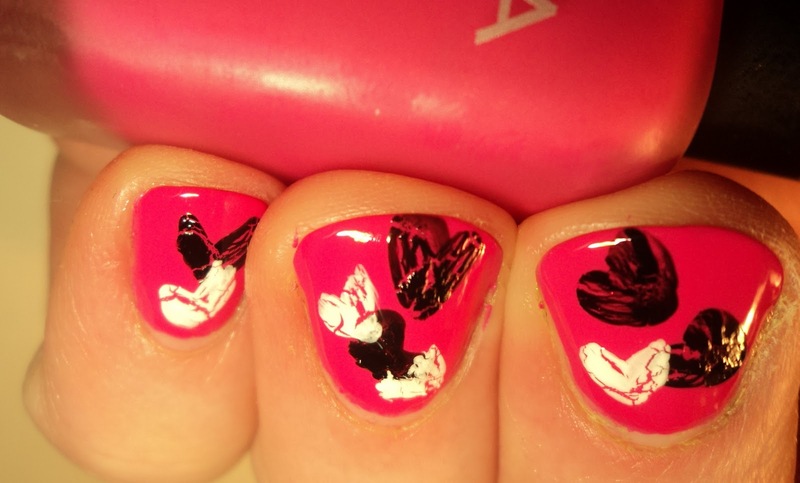 Application was fine, though I had to do 3 coats to reach full opacity. Pink. Seriously. - Bright, blue-based, medium-toned pink creme. This one isn't crazy unique, by any means, but it's so pretty. Really pretty. Seriously, pun intended, I think it's become one of my favorite pink cremes. Most of my favorite pinks leans to the warm side of the color (which is an anomaly for my pink skintone), but this one is definitely blue-based, and I really like it with my skin. I can see me wearing this one quite a bit. Application on this one was perfect. Pic is 2 coats. Next is the shimmers, which themselves can be broken down into 2 categories... metallics and jelly(ish) based shimmers. Sea How Far You Can Go - Champagne metallic shimmer. This one was a bit of an odd duck to try and describe. It's a bit champagne, a bit grey, and a bit taupe. It almost reminded me of Color Club Snakeskin without the frostiness. This is one of the 2 metallic shimmers. Formula was fine, but it was thin (which you want to achieve a nice depth to the shimmer). It took 4 coats to reach opacity. Shell Me the Truth - Pale shell pink metallic base with golden shimmer. 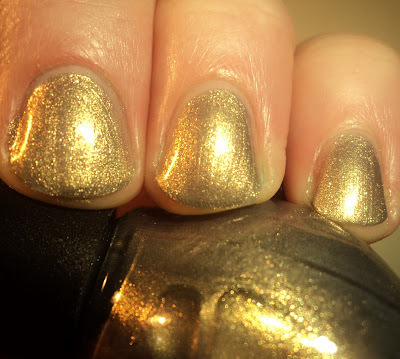 This is the second metallic based polish in the collection and truth be told, it was a total surprise. At first, I thought it was going to be your standard shimmery shell pink. 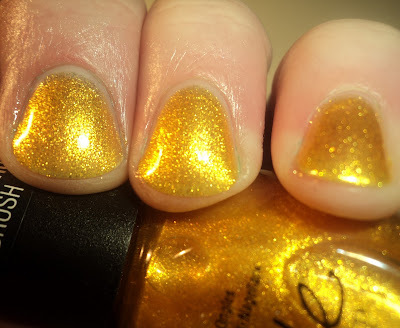 Then I put it on and was blown away by the amount of gold shimmer in this one. It's overtakes the pink base, but not in a bad way. 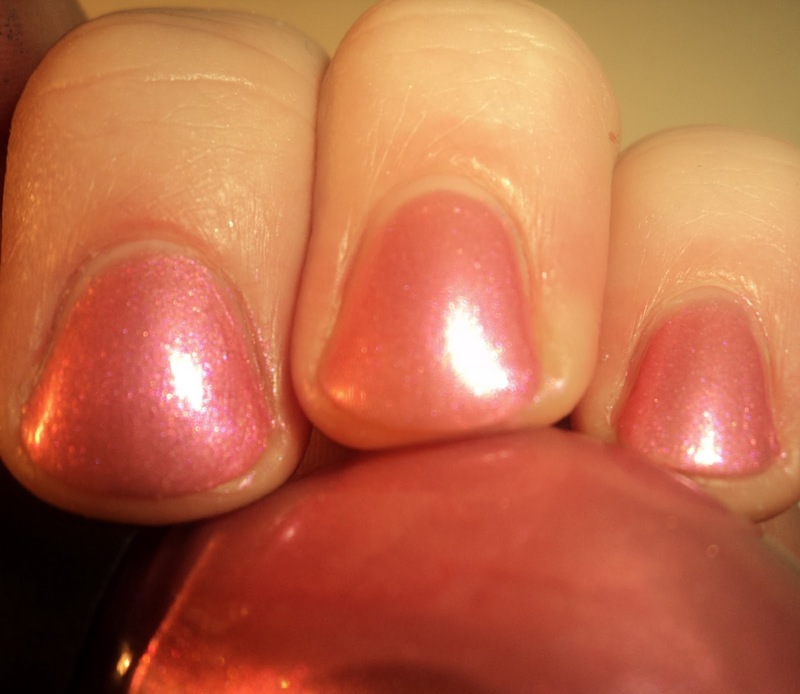 This one reminded me somewhat of China Glaze Pink Rox-E, but unlike that one, this one I actually like. Thing is, pinks with golden shimmer, rarely work on my skin. This one does. I love it, and think it's definitely one of my favorites of the collection. Again, thin formula, but not unworkable. 4 coats. Dandy Lion - Goldenrod jelly base with tonal shimmer. This one has so much shimmer that it almost looks like a metallic. It's not. It's a jelly base that suspends the shimmer. I really like the concept on this one, but I'm not a huge fan of the goldenrod color. It's beautiful, but just doesn't work with my skin. Thin formula to allow for buildable shimmer. 4 coats. Pink-Nic in the Park - Pink jelly-ish base with pink tonal shimmer. This one is so pretty. It does have a slight purple color shift, but it's not a true duochrome. I kept thinking, while I swatched it, that you pink-girls are gonna love this one. It's so pretty for spring and would look great with navy. Pic is 4 coats, but it was thin and buildable. These next three shimmers are quite similar while being different colors. They all have jelly bases and are packed with pink, blue, and purple shimmer. FYI... I wanted to mention that while I call these and the 2 above "jellies", they are not what I consider *true* jellies because they are able to reach opacity. However, they had the same "squishiness" of a jelly. The were kinda similar to OPI's new sorbet finish, just they had shimmer. HTH. 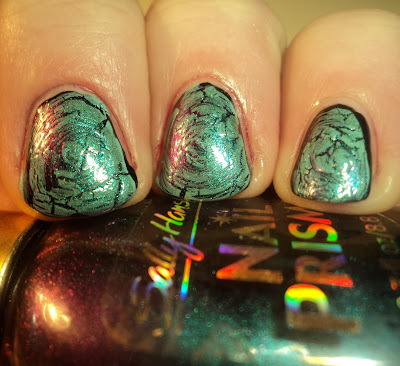 Iceberg Lotus - Green-teal with pink, blue, and purple micro-shimmer. Okay, first up... I have to mention that my picture on both this one and You're S-teal the One are not color accurate. I tried, but my little camera just couldn't handle 'em. :P Honestly, if you want to see a good idea of this color... look below. That picture is very similar to the true color of this one. 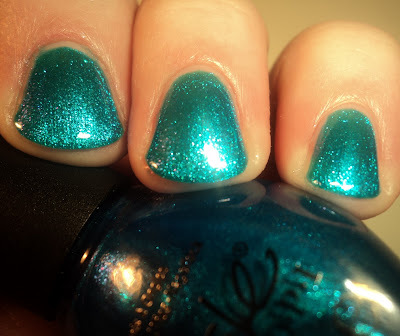 It's a really pretty green/blue shimmer (that leans more green that blue). Like the other colors, this one was thin and buildable. 3 coats. You're S-teal the One - Cerulean blue shimmer with pink, blue, and purple micro-shimmer. Again... not color accurate. It's definitely more blue than my picture shows. It's a beautiful blue that leans a bit teal. Pic is 3 coats. The bottle pic on the Target website is actually very close to this one, though perhaps a bit too blue. I'm a Pool for Your Love - deep purple jelly with blue, pink, and purple micro-shimmer. Okay, if you are a fan of purple... run... don't walk to Target and pick this up NOW. I knew I would love this one as soon as I saw the press release and I was not mistaken. It's absolutely amazing. The base is a beautiful, vampy, deep purple jelly, but what sets it apart is the gorgeous shimmer. It practically floats in the base. If you love purple... you need it. Enough said. 3 coats. All in all, I like what I've seen so far. I do think some of the names are a bit silly, but that's neither here nor there. I still have to swatch the glitters, and there is one that I think is amazing, but for my money... I'm a Pool for Your Love is where it's at. It is so fantastic. Like Top 20 fantastic! I've always thought of Nicole by OPI as OPI's little sister with the not-as-good colors and the funky bottles, but they are really stepping it up. I know they've recently changed brush designs, and as I had a few straw hairs, I think they are still ironing out those kinks, but aside from that... I think these colors are all a step in the right direction, which is giving Nicole by OPI even-footing with her big sister. Again, these are Target exclusives and only available in Target stores and on their website. They are in the $7 range.